FRESNO, Calif. - KY Farming has signed a three-year deal with the Fresno Grizzlies to be the presenting partner of "The Kodiak Club" on the second level of Chukchansi Park. The premium area encompasses the stadium's main large function room overlooking the first base side of the field, and the "600 Level" seating accessible only by seasonal Club membership or single-game Club tickets. In search of a permanent partner for the last two seasons, the organization is happy to be partnering with a local ag company, considering how great a fit it is with the rest of the "Farm Grown" motif prevalent at any given Fresno Grizzlies baseball game. Not only are the players on the field "Farm Grown," on the precipice of a career in Major League Baseball, the Grizzlies are known throughout the Central Valley for their commitment to ag, through regular farmer's markets within the ballpark during Friday home games, and their annual "My Job Depends on Ag" promotional night. 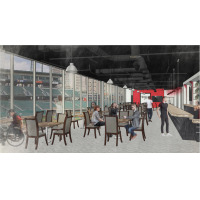 In addition to the new partnership, the new Club area is undergoing an extensive renovation, the first significant upgrade to the area since Chukchansi Park opened in 2002 (renderings attached). 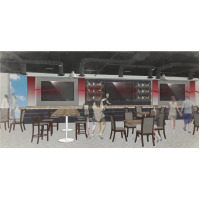 The new function room will include: A brand new walk-up and sit-down bar, new tables, chairs and barstools, renovated restrooms, new flooring, at least 10 new flat screen TVs and a new all-you-can-eat buffet for each game, with kid-friendly dessert and snack stations, to replace the catered portions of past iterations of "The Club." All told, the renovations will total over $250,000. The project is a part of an overall package of renovations to Chukchansi Park in advance of the 2019 season, totaling roughly $3.4 million. "Not only are we adding new hospitality areas to Chukchansi Park, we're vastly improving the existing gathering places around our ballpark," said Fresno Grizzlies president Derek Franks. "As our social space in left field and our new 'kids zone' in right field take shape for the 2019 season, fans who have always enjoyed patronizing 'The Club,' will notice a huge upgrade to that experience as well. We aren't content at all with the 'same old thing' at a Grizzlies game as we enter this new era. To partner with a local company, and an ag-centric one at that, makes this even better. It's just a good fit." The new club level will open its doors for the first time on April 4, opening day of the upcoming Pacific Coast League season, when the Grizzlies take on the Reno Aces (Arizona Diamondbacks) at 7:05 p.m. A "soft opening" may be on the horizon, during Fresno FC soccer, with that regular season beginning in March. "We are proud to be partners with the Fresno Grizzlies. KY Farming is a local family-owned partnership in Reedley, California that grows world class blueberries and cherries, and also packs cherries for local growers in the Central Valley. It makes sense to partner with the Grizzlies because we are both 'Farm Grown' in the Valley," said Tony Yasuda, Managing Partner of KY Farming. "We want to bring awareness to the importance of growing quality, flavor and the need for consistent water and irrigation needs. This new partnership will allow us to do that."